Lenworth industrial pass/personnel doors provide easy in and out access to your facility. We’re proud to offer sales, service, maintenance and more on all types of industrial pass doors in Greater Toronto and the surrounding area. 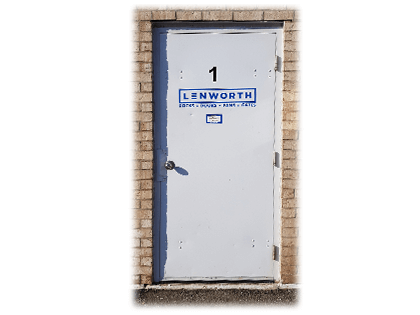 Lenworth industrial doors (pass/personnel doors) provide easy in and out access to your facility. These doors include ultra strong, tack welded seams and a clean painted finish, and are locally manufactured in Toronto. We provide all types of new installations including wall cut outs, frame replacements and fire door installations. We have hardware stocked to repair any existing door, hinges, panic bars, closers, deadbolts and more. Our best-in-class preferred service program, platinum product line offering and commitment to quality and service have made us the leader in the Loading Dock and Industrial Overhead Door industry for more than ten years. Fill out the form below or call 1-877-769-0630 to get sales, service or more information on industrial pass doors. Metal Thickness: 18ga and 16ga for more rugged applications. Our Industrial Pass Doors have a standard 20ga design that comes with tack welded seams to ensure long term rigidity. It has a standard galvanized steep finish, with prime painting available for a cleaner look. Customizable hardware is available such as panic bars, closers, window lites, brush sweeps, thumb latches and electric strikes. We also carry a number of options such as double doors, oversized, glass transom and fire rated options that can be used as interior or exterior rated. Our Industrial Pass Doors are durable and secure and can be customized to fit your facility requirements. Ensure facility and employee safety by holding trucks in place during the loading and unloading process. Lenworth offers turn-key installations and repairs on many different dock leveler models. We offer a large variety of commercial doors with a speciality in installation & commercial door repair. We’re proud to offer sales, service, maintenance and more on all types of high-speed overhead doors.